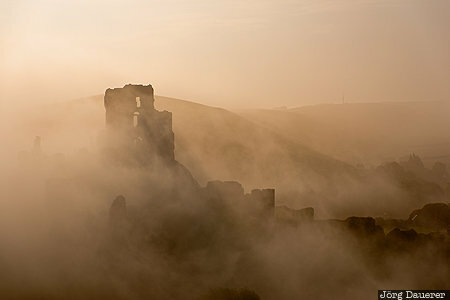 The sun breaking through thick morning fog creating sun-beams at the ruin of Corfe Castle. Corfe is in Dorset in the south of England, United Kingdom. This photo was taken in the morning of a cloudy day in May of 2018. This photo is part of the exhibition Urban Fog (October 2018). This photo was taken with a digital camera.